Item Sku - 0779711C. 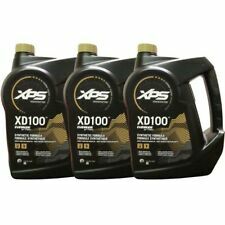 XD100 Synthetic formula for use in Evinrude E-TEC outboard engines, direct injection, or oil injected outboard engines. XD100 burns clean and is smokeless, ashless, and odorless. This kit is intended for use with all Yamaha F115 outboard models. This convenient kit includes Yamalube 10W-30 4M Outboard Mineral FC-W Engine Oil, a Genuine Yamaha oil filter, and necessary drain bolt gasket. For use in all 4-stroke marine engines. 40 HP - 1999-2017. For use in all 4-stroke marine engines. 115 HP - 2006-2014. 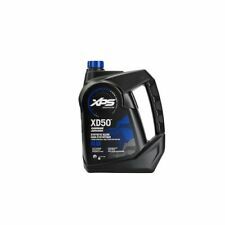 XD30™ – FOR USE IN CARBURETED 2-CYCLE OUTBOARDS. Certified FC-W and FC-W Catalyst Compatible by the National Marine Manufacturers Association. Industry leading strength and viscosity retention and the ultimate corrosion and wear protection. For use in all marine engines, including outboard, inboard, and stern-drive, which specify this viscosity of oil. Trending at $38.72eBay determines this price through a machine learned model of the product's sale prices within the last 90 days. Simply tilt engine up, remove drain screw, insert adapter, and connect drain hose. Engine drains into your bucket or drain pan,Be sure to use a new crush gasket when reinstalling drain screw plug. Drain Kit Yamaha Outboard Oil Change Hose 15hp-150HP 1994-present. This kit is intended for use with all Yamaha F75, F90 & F100 outboard models. This convenient kit includes Yamalube 10W-30 4M Outboard Mineral FC-W Engine Oil, a Genuine Yamaha oil filter, and necessary drain bolt gasket. Tohatsu / 3R0076150M. 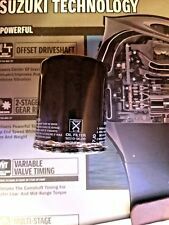 Nissan & Tohatsu Marine Oil Filter. Oil filter for 9.9A, 9.9B, 9.9B2, 9.9C, 15A, 15B, 15B2, 15C, 18B, 18B2, 20C, 25A, 25B, 30A and 30B Nissan & Tohatsu 4-stroke outboards. Genuine Nissan & Tohatsu part. 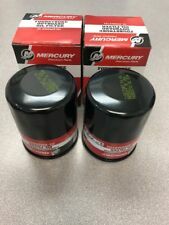 35-802893Q01 - This Mercury Quicksilver water separating fuel filter fits all Mercury, Mariner, and Force outboards equipped with an externally mounted water separating fuel filter base. This filter also fits all MerCruiser applications except for 4.3L Generation II engines with an in-line fuel filter. YAMAHA OUTBOARD 20W40 3.3L V6 OIL CHANGE KIT. THIS KIT INCLUDES (6) QUARTS OF 20W40 YAMALUBE OIL, (1) OIL FILTER, AND (1) OIL DRAIN PLUG GASKET. THIS KIT IS FOR THE FOLLOWING YAMAHA OUTBOARD MOTORS ONLY. 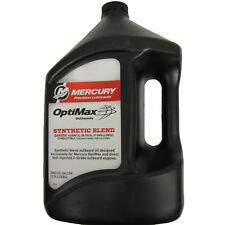 92-8M0078623 25w40 Synthetic Blend 4-Stroke Marine Engine Oil Quart. 1 x LUB-10W30-FC-04 - Yamalube 10W30 Outboard Mineral 4M FC-W Engine Oil Gallon. 1 x LUB-10W30-FC-12 - Yamalube 10W30 Outboard Mineral 4M FC-W Engine Oil Quart. 1 x ACC-GEARL-UB-QT - Yamalube Marine Gear Case Lube Oil - 32 oz. Engine: 4-stroke 9.9HP 13.5HP 15HP. Mariner 13.5hp 4-stroke (International). Replaces Carburetor Assembly Part OEM Number#. Part# 8M0107511 (Fits model year 1998 & newer 30, 40-60 HP and 75-115 HP) Also fits 25 HP prior to model year 2006. 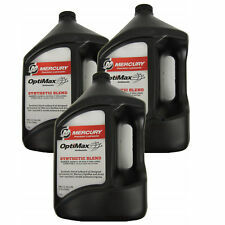 5 Liters of Quicksilver 10W-30 Marine Engine Oil (5.3 QUARTS ). SAE 10W-30 oil. 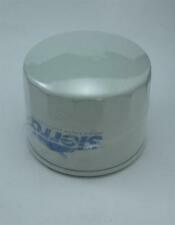 1 Oil Filter, OEM8M0065103. Filters Water and Contaminants from Fuel. This kit is intended for use with all Yamaha VF200, VF225 & VF250 SHO outboard models. This convenient kit includes Yamalube 10W-30 4M Outboard Mineral FC-W Engine Oil, a Genuine Yamaha oil filter, and necessary drain bolt gasket. WE ARE A MARINE SALES AND SERVICE FACILITY. 1200-8M0063190 SS FROM 1200-833069T9. 2.5L MOTORS. First in class for all FC-W durability test properties with industry leading internal Marine engine corrosion protection. 25W-40 Synthetic Blend Oil shows significantly better shear stability and volatility, and is higher in viscosity and High Temperature High Shear (HTHS) after shear. F70 - all models. F60 - 2006-Current. T50 - 2006-Current. F30 - 2013-Current. F40 - 2008-Current (F40A). F50 - 2006-Current. T60 - 2006-Current. This kit is intended for use with all Yamaha F200, F225 & F250 3.3L V6 outboard models. This convenient kit includes Yamalube 10W-30 4M Outboard Mineral FC-W Engine Oil, a Genuine Yamaha oil filter, and necessary drain bolt gasket. This kit is intended for use with all Yamaha F150 outboard models. This convenient kit includes Yamalube 10W-30 4M Outboard Mineral FC-W Engine Oil, a Genuine Yamaha oil filter, and necessary drain bolt gasket. 1996 Mercury Force 120 Outboard Fuel Pump Base Cover 98766-C1 115 ? hp 4 cyl . Condition is Used off of 1996 Force 120 with low compression, fits other HP and models but not sure which. For use in 4-cycle outboard engines. Superior corrosion protection. This kit is intended for use with all Yamaha VF200, VF225 & VF250 SHO outboard models. Our best full synthetic Outboard oil FC-W® rated by the National Marine Manufacturers Association (NMMA®). 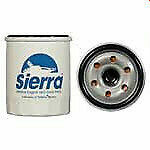 5W-30 weight provides excellent lubrication in all climates. This kit is intended for use with all Yamaha F200, F225 & F250 3.3L V6 outboard models. This convenient twin engine oil change kit includes Yamalube 10W-30 4M Outboard Mineral FC-W Engine Oil, a Genuine Yamaha oil filter, and necessary drain bolt gasket. Engine: 2-stroke 4HP 5HP. F20-05080000 Carburetor. 6BL-W0093-00 Carburetor Repair Kit. FLYING FISH MARINE Outboard Engine Parts. 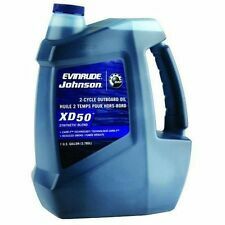 for Johnson Evinrude OMC 35hp - 55hp. for Johnson F95 Engine Pump. for Tohatsu Johnson Evinrude 3.3HP. Go it one better. Go with Yamalube 4M. Trending at $19.94eBay determines this price through a machine learned model of the product's sale prices within the last 90 days. VF200, VF225, VF250. F300, F350 (V8). Engine: 4-stroke 4HP 5HP 6HP. Replaces Carburetor Assembly Part OEM Number#.